by Chris Woodford. Last updated: July 9, 2018. Photo: An inexpensive pair of earbuds will usually fail sooner or later, either where the cable meets the phones or where it joins onto the jack plug. You'll need to use a knife or scissors, a burning match, and a hot soldering iron. Please take appropriate safety precautions with these hot, sharp, dangerous things, solder only in a well-ventilated room, and so on. If you're a young person, ask an adult to help. If your headphones are broken, you may not worry too much about taking a risk trying to repair them. But be warned: it is possible (though unlikely) that you will damage delicate components in your headphones if you don't solder carefully. Use a heat sink or apply the soldering iron for short periods of time to reduce the chances of heat damage. It's also possible that if you don't repair your headphones correctly, you could damage any audio equipment you connect them to. We accept no responsibility for any accidents, injuries, or disasters that result from your using the information here. You follow these instructions entirely at your own risk. A replacement jack plug (I tell you where to get this below). A vise to hold things safely while you solder. Some matches or a cigarette lighter. A penknife, some scissors, or a wire cutter. Using a pair of scissors or a knife, cut off the old jack plug. If it's a molded plug, throw it away—it's no use. 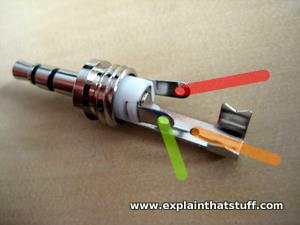 You will need to buy a new jack plug to replace it. Assuming you are replacing one of the smaller plugs on a standard pair of headphones or earbuds, the item you need is called a 3.5mm stereo jack plug and you can buy it easily online from an electronic parts shop or from an electronics store if you have one nearby. Make sure you get a stereo one; mono plugs look very similar. If you're replacing one of the larger-style plugs, these instructions still apply, but you obviously need to buy a replacement that matches the size of your original plug. The one I have here has a screw-on outer case and a clamp at the top for securing the cable in place: it stops you ripping the cables out of the plug if you pull on the lead too hard. The clamp is a good idea unless you want to go through this exercise again in a few weeks time! One quick point to note in passing: the replacement jack plug will almost certainly be considerably larger than the molded plug you're replacing. That's just unavoidable: the tiny plugs fitted to things like iPod earbuds in factories are soldered and molded on by machines with "nimble fingers"! 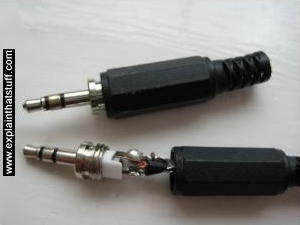 Photo: 1) A replacement jack plug like this is a fraction the cost of a new pair of headphones. 2) Unscrew the case and you'll see three terminals to which you'll reattach your cable. There are small holes in the terminals through which you push the wires before you solder them in place. In theory, you can reuse a plug like this over and over again just by removing old cables from it. In practice, it can be tricky to get all the old solder off and the terminals snap off if you bend them too many times—so I'd strongly suggest you buy a new plug instead. Prepare your cable. A headphone stereo cable has two cables running through it, one for the left channel and one for the right. These are usually colored red and green. Each of these cables is surrounded by copper wire (the ground). Strip the red and green cables back so you have about a half inch to an inch of clean and shiny bare wire. Keep the red and green wires separate, but twist the two sets of copper wire together—so you have three wires instead of four. Photo: The wires inside a stereo cable. Strip the cable back so you have about 2.5cm (1 inch) of wire. Join the two copper ground wires together so you have three wires instead of four. Sometimes you will find earbud cables that are wired up slightly differently. 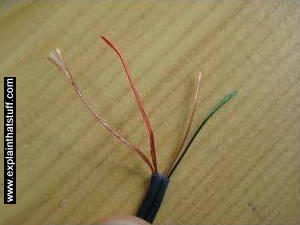 One of the stereo cables will have a red or green wire inside surrounded by ordinary, copper-colored wire. The other cable will have green or red cable surrounded by red and green "striped" wire. In this case, the red and green "striped" wire is your ground, equivalent to the copper-colored wire in the other cable. So you wrap that in with the copper-colored wire, giving you a red wire, a green wire, and a third wire that's a mixture of copper-colored wire and red and green wire. I hope that's clear. Unscrew the case of your jack plug and you'll see the three terminals for the three wires in your cable. Now, before you solder the wires, you need to thread the cable through the top (plastic) part of the plug (in other words, the cover) so it's ready to screw back on to the metal base afterward. It's very easy to forget this step—and if you do forget, you'll have to take the wires off again and repeat the process, which (believe me) is very annoying. If you know how to "tin" the bare wires, it's a good idea to do that now. Tinning means you lightly cover the bare cables with solder so they make better joints and better electrical contact. Here's a good description of tinning. Also before you solder, remember the golden rule: soldering is not the same as welding. Solder is not metal adhesive: unlike welding, it's designed to make a good, reliable electrical connection, not stick two metals together. It is very important to make a good mechanical joint between the wires and the terminals (by poking the wires through the holes and wrapping them round a couple of times) before you solder. At this point, if you wish, you can check your wiring. 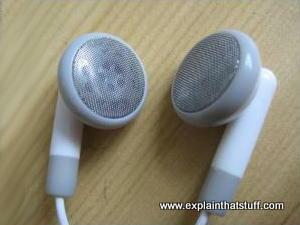 Put the earbuds into your music player and with the wires touching the contacts, see if you hear stereo. You'll need to touch the wires very firmly to the contacts. You may get "flickering" or crackly sound as you jiggle the wires on the contacts, but don't worry—that should disappear when you solder them firmly into place. If you hear nothing, you might want to check that the wires are properly prepared, tinned, and connected the right way around. It can be quite tricky to support such a small jack plug while you're soldering it. But, whatever you do, DON'T under any circumstances hold or touch the bottom of the jack plug while you solder the top of it: the heat will travel through the electrical pins in about a second and burn your fingers. I know—I've made this mistake more than once! Either use a vise or some other method of holding the plug securely to an old table (for example, a large bulldog clip). You can improvize in all kinds of ways, but make sure your new jack plug is completely secure and motionless before you think about soldering: if it moves as you solder, or as the solder is cooling, you will end up with a "cold joint" (a poor and unreliable connection). If you get the red and green wires mixed up, your headphones will still work but the left and right channels will be switched over. Sometimes it can be hard to know if you've got this right. One way to check is to listen to some music that you know plays certain passages or instruments mainly on the left or the right channel with speakers or other phones. (If Slash's guitar solo is in your left ear before you solder, you want it in your left ear afterward as well.) Then check your work by listening to the same music with your repaired phones. If you really want to be sure about your stereo, you can check your left and right channels with this little sound tester I've made. You'll hear a short audio message at the start in both headphones. Then you should hear a plucked note only in the left headphone followed by a note only in the right headphone. When your soldering is done, carefully place all three soldered wires inside the clamp at the top of the plug and crimp it tight with some pliers. This protects the soldered connections and stops them breaking when you pull on the cable. There's one, final tricky step. You may need to push all the soldered connections together toward the center so they fit snugly inside the case when you screw it up again. It's important to ensure the three wires are well clear of one another when they're soldered and pushed together. If they touch anywhere, you'll either lose sound in one or both of the headphones or get mono instead of stereo. Screw on the top, test your headphones, and you should be pleasantly surprised! If they don't work, how come? If you're confident your soldering was okay, the problem is probably that the newly soldered wires are touching inside the plug. So unscrew the plug and try your earbuds with the cables eased away from one another slightly. If they work now, you have to make sure the cables aren't being pressed together inside the plug. You can always use a little insulating tape to keep them separate. Alternatively, you could cover your soldered joints with heat shrinks, but it's a fiddly process on wires this small and not something I have ever found it necessary to do. If your soldering is at fault, you can always remove the cables and try again. Clean up the jack plug by melting the old solder off with the soldering iron, shorten your cable a little bit more, and repeat the process above. If you happen to have two broken pairs of earbuds, you can often join them together to make a single working pair—and it's a lot easier to do this than to add a new jack plug. Suppose one pair has a broken jack and the other has broken earbuds. Simply cut the wires of both pairs in half (or wherever you like) and join the working earbud section from one pair to the working jack section from the other pair. You'll need to cut, strip, and prepare the wires as I've described above, and you'll also need to match the wires from one pair of earbuds correctly to those in the other pair (which can be tricky if they're different colors) before you solder. You'll also need to cover the soldered joints with heat shrinks or insulation tape to stop the bare wires from touching and shorting. As an alternative repair (along very much the same lines), buy yourself a headphone extension cable and solder that to your broken earbuds instead. Photo: Solder isn't glue. Before you solder two pairs of broken headphones together, make sure you clean the bare wires and twist them tightly together to make a firm mechanical joint (one that doesn't easily pull apart). When you solder a joint like this, heat it from below and apply the solder from above so it flows into the joint like water soaking down into a sponge. After you've applied some insulation, you can reinforce the joint further if you want to: wrap some sturdy wire around it then add more insulation on top. This is much trickier than replacing just a jack plug, but it's essentially the same operation. Even if only one headphone or earbud is broken, you should really cut the cable off both headphones or earphones, shorten it by however much you need, and then repair both phones. If you don't do this, you'll have one of the stereo wires slightly shorter and carrying slightly more current than the other and that can damage both your headphones and whatever they're connected to. Exactly how you take the headphones or earbuds apart varies from brand to brand. Take a look at our main article on headphones for some reference photos that may help. What if your cable has more wires? If you have a pair of ordinary headphones or earbuds and a five- or six-wire cable, the most obvious explanation is that some of the wires are not being used: for some reason, the manufacturers have used a multi-wire cable but only connected up three or four of the wires. In this case, you'll need to use a multimeter (or trial-and-error) to find out which of the wires you need to connect. With luck, you might be able to open up the earbuds or headphones at the listening end to find out which wires are connected where and carrying the sound signals; you can then figure out what you need to do at the jack-plug end. If you can't do that, because your headphones are molded or impossible to open, your options are more limited. The job is made harder by the fact that different manufacturers use different (and entirely arbitrary) color-coding for their wires—so I can't, unfortunately, give any general advice. The best tip is to type "6 wire headphone cable" followed by the name of your headphones or earbuds into a search engine and hope someone has posted details on a forum. Another situation where you might find more than three or four wires is if you're using a more complex headset with a built in microphone or something like noise-canceling headphones. Unfortunately, this is another case where you'll have to rely on a multimeter and/or trial and error. Thanks so much to all the people who've sent feedback and suggestions to help me improve these instructions. I hope they work for you too! How to solder: Mike Allen from Popular Mechanics gives a perfect (1.5-minute) demonstration of soldering, covering essential points like getting the wires clean, making a good mechanical joint, and not disturbing the joint until it's properly cooled. This is exactly the right way to do it. Soldering: Jonathan Hare of the Vega Science Trust shows how to solder a component to a circuit board and how to tin wire before you start. He also shows how to remove the insulation from a wire with a soldering iron (though as I explained above, I prefer to burn it off with a flame). Collin's Lab: Soldering: Collin Cunningham offers a characteristically geeky introduction to how and why soldering works. How to Diagnose and Fix Everything Electronic by Michael Geier. McGraw Hill Professional, 2015. If you're feeling empowered and emboldened by a successful headphone fix, why stop there? Michael's book outlines the kind of test and repair tools you'll find useful, looks at how things are made and where they fail, and then runs you through common fixes for typical household gadgets, from audio amps to video players and laptops. Troubleshooting and Repairing Audio Equipment by Homer L. Davidson. TAB Books, 1996. A more general guide that covers CD players, loudspeakers, amplifiers, and bigger bits of audio kit. Don't be put off by the date: analog audio equipment works in exactly the same way today as it did when the book was written.